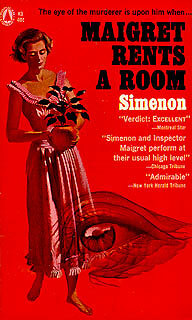 Tout Simenon (PDLC '91-'92): Tome 5, pp. 337-432 (96pp). Janvier is shot in the chest while keeping watch outside Mlle. Clément's boarding house waiting for the return of Emile Paulus, a young man who lived there, suspected of having robbed a bar. M, his wife in Alsace caring for her sister, moves in the the house. He discovers Paulus hiding under Mlle. Clement's bed, but he appears to be unconnected to the shooting. A boarder, Mlle Blanche Dubut, mentions to M the occasional strange condition of the blinds in the house opposite, where Mme Francoise Boursicault, the invalid wife of a ship's purser lives, and M goes to interview her. He realizes that the person who shot Janvier was apparently someone who came to visit her from time to time, and forces the issue, eventually discovering that Julien Foucrier, her lover from long ago, who had fled France twenty years earlier to escape apprehension for a robbery-murder he had committed, had returned to France, and was her visitor. He had shot Janvier to flee the apartment before the return of her husband, wrongly assuming that the watch in the street was for him. He turns himself in after M agrees to keep the woman's connection to the affair a secret.